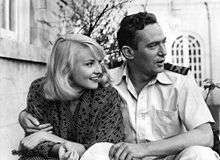 Frederick George Peter Ingle Finch (28 September 1916 – 14 January 1977) was an English-born Australian actor. He is best remembered for his role as "crazed" television anchorman Howard Beale in the film Network, which earned him a posthumous Academy Award for Best Actor, his fifth Best Actor award from the British Academy of Film and Television Arts, and a Best Actor award from the Golden Globes. He was the first person to win a posthumous Academy Award in an acting category. George Finch was born in New South Wales, Australia, but was educated in Paris and Zürich. He was a research chemist when he moved to Britain in 1912 and later served during the First World War with the Royal Army Ordnance Depot and the Royal Field Artillery. In 1915, at Portsmouth, Hampshire, George married Alicia Fisher, the daughter of a Kent barrister. However, George Finch was not Peter Finch's biological father. He learned only in his mid-40s that his biological father was Wentworth Edward Dallas "Jock" Campbell, an Indian Army officer, whose adultery with Finch's mother was the cause of George and Alicia's divorce, when Peter was two years old. Alicia Finch married "Jock" Campbell in 1922. George gained custody of Peter and he was taken from his mother and brought up by his paternal "grandmother" Laura Finch (formerly Black) in Vaucresson, France. In 1925 Laura took Peter with her to Adyar, a theosophical community near Madras, India, for a number of months, and the young boy lived for a time in a Buddhist monastery. Undoubtedly as a result of his childhood contact with Buddhism Finch always claimed to be a Buddhist. He is reported to have said: "I think a man dying on a cross is a ghastly symbol for a religion. And I think a man sitting under a bo tree and becoming enlightened is a beautiful one." In 1934-35 he appeared in a number of productions for Doris Fitton at the Savoy Theatre, some with a young Sumner Locke Elliott. He also worked as a sideshow spruiker at the Sydney Royal Easter Show, in vaudeville with Joe Cody and as a foil to American comedian Bert le Blanc. At age 19 Finch toured Australia with George Sorlie's travelling troupe. Finch's first screen performance was in the short film, The Magic Shoes (1935), an adaptation of the Cinderella fairy tale, where Finch played Prince Charming. Laurence Oliver and Vivien Leigh toured Australia in 1948 with the Old Vic Company. They attended Mercury production of The Imaginary Invalid on the factory floor of O'Brien's Glass Factory starring Finch. Olivier was impressed with Finch's acting and encouraged him to move to London. He left Australia in 1948. For Disney he played Alan Breck in a version of Kindnapped (1960). He then received great acclaim for his performance as Oscar Wilde in The Trials of Oscar Wilde (1960), winning another BAFTA; the film however was not popular. Finch's next three films saw him support notable female stars: Sophia Loren in Judith (1966), Melinda Mercouri in 10:30 P.M. Summer (1966) and Julie Christie in Far from the Madding Crowd (1967). He was reunited with Aldrich for The Legend of Lylah Clare (1968). The Red Tent (1970) was an expensive international adventure film, with Finch as Umberto Nobile. Shortly after Raid on Enetebbe finished shooting, Finch undertook a promotional tour for Network. He appeared on The Tonight Show Starring Johnny Carson one day prior to suffering a heart attack in the lobby of the Beverly Hills Hotel. He died on 14 January 1977, at the age of 60; he is interred in the Hollywood Forever Cemetery. We all say we're going to quit occasionally... I'd like to have been more adventurous in my career. But it's a fascinating and not ignoble profession. No one lives more lives than the actor. Movie making is like geometry and I hated maths. But this kind of jigsaw I relish. When I played Lord Nelson I worked the poop deck in his uniform. I got extraordinary shivers. Sometimes I felt like I was staring at my own coffin. I touched that character. There lies the madness. You can't fake it. Finch was married three times. In 1943, he married Romanian-born French ballerina Tamara Tchinarova; they worked together on a number of films. They had a daughter, Anita, born in 1950. They divorced in 1959, after she discovered his affair with actress Vivien Leigh in California. He then married South African-born actress Yolande Turner (née Yolande Eileen Turnbull); they had two children together, Samantha and Charles Peter. During their marriage, Finch had an affair with the singer Shirley Bassey. Bassey had a daughter, also called Samantha, born in 1963; Bassey's husband at the time, the openly gay film producer Kenneth Hume, believed that Finch was her biological father. Finch and Turner divorced in 1965. In 1972 Finch married Mavis "Eletha" Barrett, who was known as Eletha Finch. They had a daughter together, Diana. 1 2 3 4 5 6 7 "Finch, Frederick George Peter Ingle (1916–1977)". Australian Dictionary of Biography Online Edition. Retrieved 27 July 2008. ↑ Some sources say that Finch's real name was William Mitchell, but there are no records that substantiate this, and it appears to be an urban myth. ↑ "Index entry". FreeBMD. ONS. Retrieved 6 May 2011. ↑ Peter Finch at AllMovie. ↑ "Peter Finch". AllMovie. Retrieved 27 July 2008. ↑ "Peter Finch – Actors and Actresses". ↑ "The Repertory Theatre". The Sydney Morning Herald. National Library of Australia. 16 December 1933. p. 8. Retrieved 11 February 2012. 1 2 "World War Two Nominal Roll". ↑ "18 Aug 1949 – The Social Round of Events in Sydney Yesterday". Trove. ↑ "Finch, In Films, Plays A Zestful Strangler". The Sunday Herald. Sydney: National Library of Australia. 10 April 1949. p. 8 Supplement: Magazine. Retrieved 12 February 2012. 1 2 Richard Brooks (7 August 2005). "Olivier Worn Out by Love and Lust of Vivien Leigh". The Sunday Times. timesonline.co.uk. Retrieved 27 July 2008. ↑ "Peter Finch Wins £87,500 Contract". The Sydney Morning Herald. National Library of Australia. 20 November 1954. p. 3. Retrieved 11 February 2012. ↑ "The Most Popular Film Star in Britain." The Times (London) 7 December 1956: 3. The Times Digital Archive. Web. 11 July 2012. ↑ "British Actors Head Film Poll: Box-Office Survey", the Manchester Guardian (1901–1959) (Manchester) 27 December 1957: 3. ↑ "'Slumdog Millionaire' fulfills its Oscar destiny". TODAY.com. ↑ Artsvi Bakhchinyan (2012). Внучка армянского помещика, соперница Вивьен Ли, переводчица балетных звезд [Granddaughter of an Armenian landowner; rival of Vivien Leigh, interpreter to ballet stars]. Inie Berega (in Russian). Retrieved 21 March 2015. ↑ Paul Donnelley (2003). Fade to Black: A Book of Movie Obituaries. Music Sales Group. p. 240. ISBN 978-1-84938-246-5. 1 2 Dancing into the Unknown, Tamara Tchinarova Finch, 2007; ISBN 978-1-85273-114-4; accessed 20 August 2014. ↑ Boshoff, Alison (30 October 2009). "Shirley Bassey hints the 'suicide' of her rebellious daughter could have been murder". Daily Mail. ↑ "No title". The Sydney Morning Herald. National Library of Australia. 28 April 1941. p. 4. Retrieved 11 February 2012. ↑ "From George, With Sadness". The Australian Women's Weekly. National Library of Australia. 27 August 1969. p. 13. Retrieved 10 February 2012. ↑ Finch, Peter (1916–1977) at the British Film Institute's Screenonline. (N.B. : Miscalculates age at time of death as 61, not 60.). ↑ "BFI Screenonline: Finch, Peter (1916-1977) Biography". ↑ ""Sons of the Anzacs".". The Mercury. Hobart, Tas. : National Library of Australia. 10 February 1945. p. 9. Retrieved 11 February 2012. ↑ "2nd Moscow International Film Festival (1961)". MIFF. Retrieved 2012-11-04. ↑ "Berlinale 1961: Prize Winners". berlinale.de. Retrieved 23 January 2010. ↑ "K.C.s as Jurors in New Play". The Sydney Morning Herald. National Library of Australia. 20 June 1944. p. 5. Retrieved 11 February 2012. ↑ "Music and Drama The Flying Emus". The Sydney Morning Herald. National Library of Australia. 18 November 1944. p. 8. Retrieved 11 February 2012. ↑ "Rattigan Play Presented". The Sydney Morning Herald. National Library of Australia. 25 September 1947. p. 7. Retrieved 11 February 2012. ↑ THE THEATRES: LYCEUM: "French Without Tears" The Scotsman [Edinburgh, Scotland] 04 Apr 1950: 4. ↑ OPERA HOUSE: "Captain Carvallo" The Manchester Guardian 27 June 1950: 5. ↑ "Soldier-Poet In Portrayal; Climax Misses: Friendly Smile Australian Iago" by Harold Hobson. The Christian Science Monitor [Boston, Massachusetts] 27 October 1951: 10. ↑ "Talking off the Cuff" Williams, W. E. The Observer [London] 16 October 1949: 6. ↑ "Leading artists heard in famous plays". The Australian Women's Weekly. National Library of Australia. 25 March 1939. p. 46. Retrieved 11 February 2012. ↑ "Iron Lung Inventor at 5 AD Tomorrow". The Advertiser. Adelaide: National Library of Australia. 1 April 1939. p. 27. Retrieved 11 February 2012. ↑ "Broadcasting". The Sydney Morning Herald. National Library of Australia. 7 June 1939. p. 7. Retrieved 11 February 2012. ↑ "Night Nurse". The Argus. Melbourne: National Library of Australia. 24 June 1939. p. 2. Retrieved 11 February 2012. ↑ "New popularity for old-time plays". The Australian Women's Weekly. National Library of Australia. 15 February 1941. p. 43. Retrieved 11 February 2012. ↑ "Melba Memorial Concert". The Advertiser. Adelaide: National Library of Australia. 17 May 1941. p. 17. Retrieved 11 February 2012. ↑ "Radio Acting Awards". The Sydney Morning Herald. National Library of Australia. 14 April 1947. p. 5. Retrieved 11 February 2012. ↑ "Acting Awards". The Sydney Morning Herald. National Library of Australia. 8 March 1948. p. 2. Retrieved 11 February 2012. ↑ "This Weeks's Radio Features". The Advertiser. Adelaide: National Library of Australia. 30 March 1946. p. 7. Retrieved 11 February 2012. ↑ "5 AD's 'Big Sister' Ends Tonight". The Advertiser. Adelaide: National Library of Australia. 17 August 1946. p. 13. Retrieved 11 February 2012. ↑ "A.B.C. to Open New Station; Thebarton Match From 5 AD". The Advertiser. Adelaide: National Library of Australia. 24 July 1948. p. 7. Retrieved 11 February 2012.